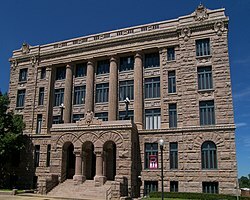 Lamar County is a county located in the U.S. state of Texas, in the Northeast Texas region of the state. As of the 2010 census, its population was 49,891. Its county seat is Paris. The county was formed by the Congress of the Republic of Texas on December 17, 1840 and organized the next year. It is named for Mirabeau Buonaparte Lamar, the second president of the Republic of Texas. Lamar County comprises the Paris, TX Micropolitan Statistical Area. The majority-white population supported the Democratic Party well into the late 20th century, when it was nearly a one-party state. But in the early 21st century, most have shifted to the Republican Party. Lamar County is now represented in the Texas House of Representatives by Gary VanDeaver of New Boston, Texas. Republican US Representative Marsha Farney, reared in Lamar County, represents District 20, which includes the northern portion of Williamson County in the Austin suburbs. According to the U.S. Census Bureau, the county has a total area of 933 square miles (2,420 km2), of which 907 square miles (2,350 km2) is land and 926 square miles (2,400 km2) (2.8%) is water. As of the census of 2000, there were 48,499 people, 19,077 households, and 13,468 families residing in the county. The population density was 53 people per square mile (20/km²). There were 21,113 housing units at an average density of 23 per square mile (9/km²). The racial makeup of the county was 82.46% White, 13.47% Black or African American, 1.08% Native American, 0.40% Asian, 0.02% Pacific Islander, 1.17% from other races, and 1.41% from two or more races. 3.33% of the population were Hispanic or Latino of any race. There were 19,077 households out of which 32.30% had children under the age of 18 living with them, 54.00% were married couples living together, 13.20% had a female householder with no husband present, and 29.40% were non-families. 26.10% of all households were made up of individuals and 12.30% had someone living alone who was 65 years of age or older. The average household size was 2.48 and the average family size was 2.99. In the county, the population was spread out with 26.10% under the age of 18, 8.60% from 18 to 24, 26.80% from 25 to 44, 22.90% from 45 to 64, and 15.60% who were 65 years of age or older. The median age was 37 years. For every 100 females there were 91.30 males. For every 100 females age 18 and over, there were 86.80 males. The median income for a household in the county was $31,609, and the median income for a family was $38,359. Males had a median income of $30,539 versus $21,095 for females. The per capita income for the county was $17,000. About 12.80% of families and 16.40% of the population were below the poverty line, including 22.50% of those under age 18 and 14.30% of those age 65 or over. In addition, Paris Junior College serves the county. ^ "Lamar County". Texas Almanac. Texas State Historical Association. 2015-05-22. Retrieved June 20, 2015. ^ "Texas House of Representatives".